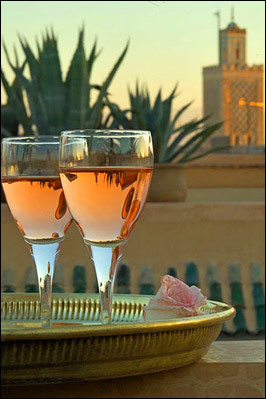 Morocco is known for its artisans and the art of the jeweler or silversmith is one of many crafts practiced today. 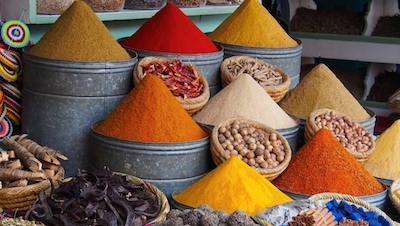 During your trip to Morocco you can watch artisans at work, marvel at the workmanship and detail of pieces in the jewelry souks and even negotiate the purchase of a unique piece. Many items of jewelry are appealing for their aesthetic value, but all pieces – whether new fabrications or antique treasures – draw on a fascinating history and symbolism. Berbers traditionally wore silver and still do today although gold has become increasingly popular, especially in urban areas, due to its higher value. This probably was due to its availability: Morocco is a top 20 global silver producer and mines have been in use in the Souss-Massa- Draa region since the 1st century AD. Due to this resource, the town of Tiznit has grown as a major center of silver production and sales. The arrival of Islam in Morocco in the 7th century added a religious justification to the preference for silver, as certain texts of the Quran forbid the wearing of gold jewelry. As in many traditional cultures, jewelry was and remains multi-purpose. It serves practical and adornment purposes as well as embodying a protective aspect or indicating wealth or social status. 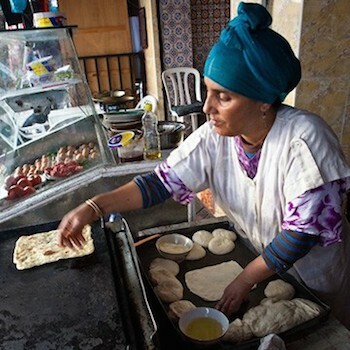 Morocco has for many centuries been a melting pot of cultures and trading routes and as a result, many techniques were imported alongside materials or came with immigrant groups. Jews (coming from the Middle East during early migrations or later from Al-Andalus) were masters of the silversmithing techniques and passed their knowledge to their Berber neighbours and colleagues. 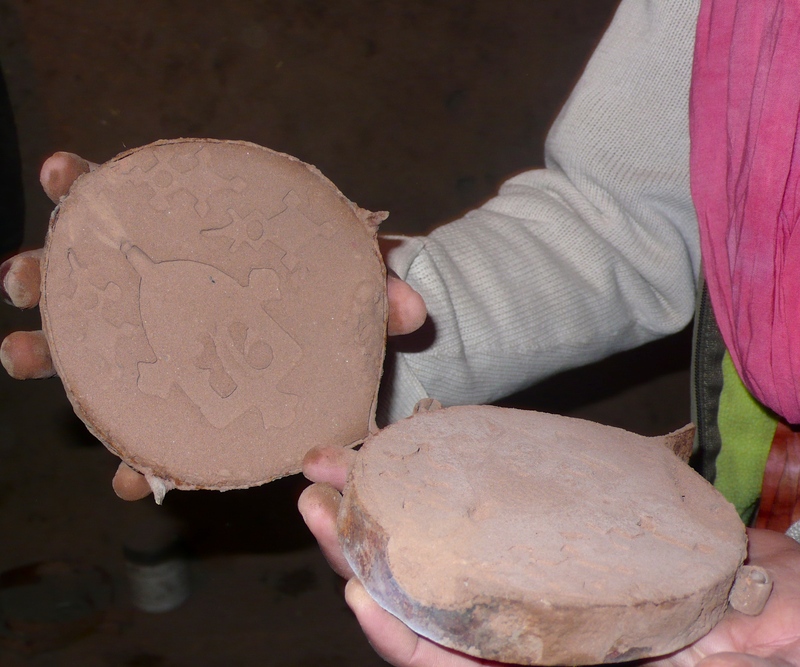 In many places, such as the Mellah (Jewish quarter) of Marrakech or the village of Amezrou near Zagora, it is possible to visit craftsmen who still practice these methods of casting, piercing and enameling today, although the Jewish craftsmen are long gone. 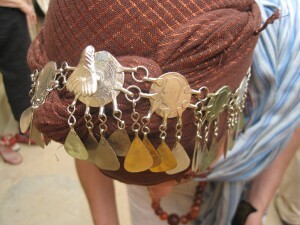 In Essaouira and in Fes, you will spot modern filigree work typical of the Jewish jewelers of a bygone era. 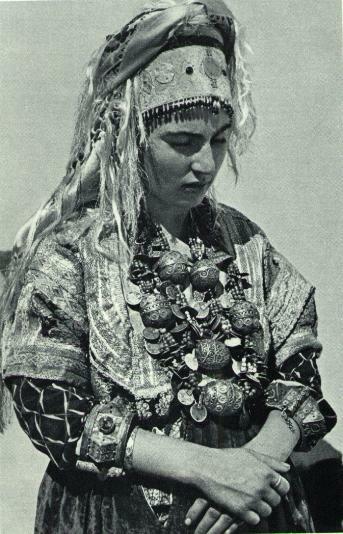 Berber women often receive elaborate silver jewelry from their husbands at the time of marriage. This ensures that she has her own wealth in the event of hardship or of becoming widowed. Traditionally, these pieces are worn at the wedding and include headdresses, earrings, necklaces, bangles, bracelets and rings. One of the headdresses worn by all Berber women at weddings is called a Tasfift and is essentially an ornate headpiece adorned with silver or nickel coins featuring King Mohammed V or Hassan II. It has a rooster or chicken featured on the tip of the head to promote fertility of the new bride. 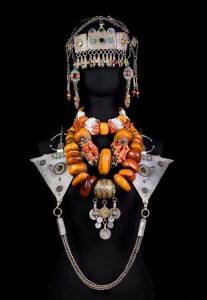 The pieces worn by Berber women at weddings often feature beads of coral, amber or semi-precious stones plus cast coins and linked chains. 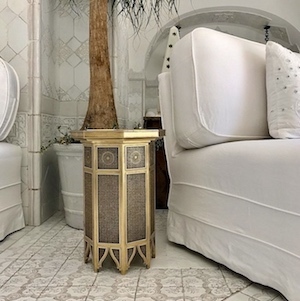 Shapes and forms include those which are intended to ward off evil or geometric shapes reflecting both the Islamic tradition and Berber symbology. Many families sadly no longer have these heirlooms and in modern cities has become common to hire costume jewelry for the wedding day. 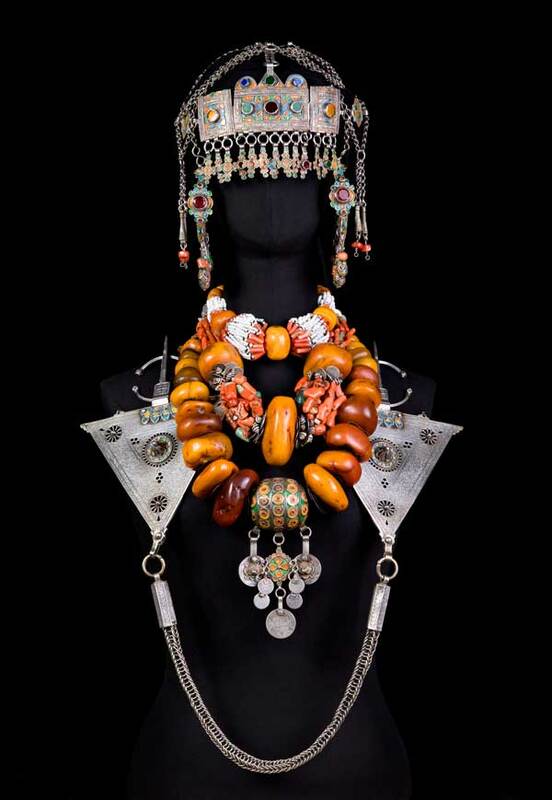 It is possible to see examples of traditional Berber jewelry in the excellent Museums of Berber culture in Agadir and at the Majorelle Gardens, Berber Museum, in Marrakech. A typical silver piece is the ‘fibula’. These are still made today and make unusual gifts as brooches. In fact, although decorative, the fibula has a very practical application in that it is used to join or fasten fabrics such as cloaks. It usually consists of either a singular triangle with a pin for fastening, or two such sections connected by a chain. The fibula design came to Morocco with the Romans and is essentially an early form of the safety pin. However, Berber craftsmen brought this useful item to a whole new level of aesthetics and symbolism. The triangular shape is said to represent woman (and fertility) and the tent (and therefore home or family). During your visit to Morocco, you will see the Hand of Fatima or ‘khamsa’ represented everywhere from door knockers to decorations to jewlery. Common to the Islamic and Jewish faiths, it is believed to ward off evil or jealousy. The hand – with its five digits – is intrinsically linked to symbols of other faiths and cultures such as the five-pointed star or the pentagram. 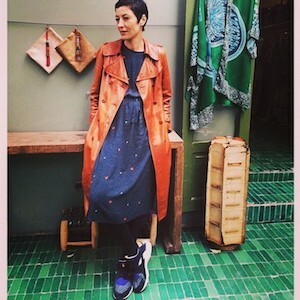 Modern and older khamsa pendants are available in souks all over Morocco. Another common form is the ‘agadez’ or southern cross. These pendants are traditionally native to the Touareg tribes of the desert and are available across Morocco. There are said to be at least 21 variations on the central theme of an elaborate cross, each representing a tribe or homeland. Agadez crosses are made in the traditional way using a lost wax technique. Silver is melted on coal embers, and poured into a wax mold, placed in a mold of clay. Inserts of wood, glass or semi-precious stones, are sometimes added. It is said that these items are used for navigation in the desert, with the central cross denoting the four compass points. 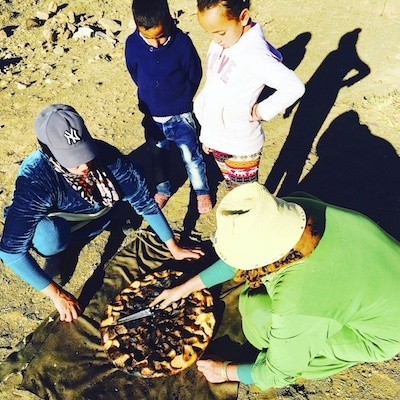 The traditions and designs related to Berber jewlery are sure to give any visitor to Morocco a great insight into local culture… As well as making a great gift or souvenir purchase!